I feel like I have two distinct styles: all black everything and colorful princess. This is obviously the latter of the two and I couldn't be more obsessed with these Seamstress of Bloomsbury separates! This is actually my first outfit from this small London-based business but I'm quite certain it won't be my last. 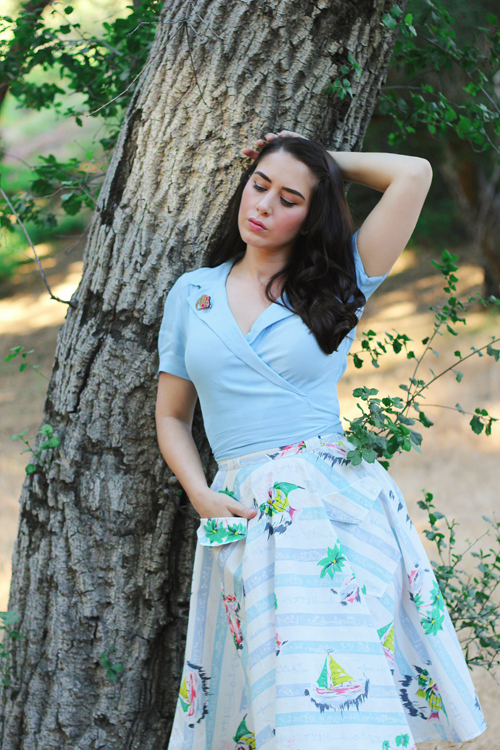 You can read my full review for the Greta blouse and Thelma skirt below! The Greta blouse is made from a light, crepe de chine rayon and features a statement collar, gathering at the shoulders on the sleeve, and a true wrap style closure. I took a size UK10 and honestly, I could have easily sized down. Because of the wrap feature I was able to cinch it to a desirable fit. I love the fabric, I feel like it's perfect for the very hot summer we're already having. I can't wait to style it with high-waist palazzo pants for an easy breezy date night with Kevin! 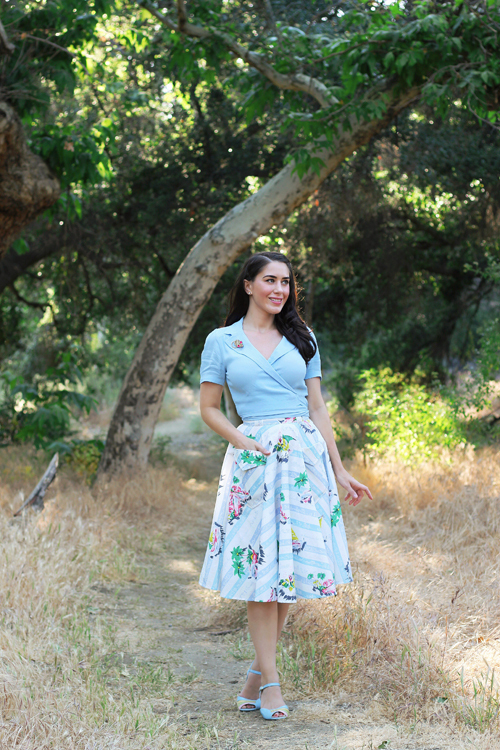 The Thelma skirt is made from a sturdy but soft cotton fabric and features a thick waistband with belt loops, true circle style skirt with beautiful exposed front pockets and a zippered closure. Like the Greta blouse, I also took a UK10. This skirt was was a great fit, considering I'm usually a UK8. If you're in between sizes I would definitely recommend sizing up! I love the gorgeous seaside print, it truly keeps longing for a much needed vacation at bay. I'm also planning to use this skirt as a swim coverup, I have a swim top that's basically the perfect match for this skirt. Since I don't actually swim in the water, I feel like this skirt will get lots of wear under a cabana with a cool, fruity drink in hand! Have you shopped with Seamstress of Bloomsbury before? What's your go-to piece? Let me know in the comments below!